Fully catered hike from Green Cape Lighthouse to Boyd’s Tower – with 2 nights in camp at Saltwater. A full day discovering the wonders of Saltwater exploring the nearby caves, rockpools and hidden beaches. An optional guided kayak tour along one of the stunning creeks. Hot showers, comfy beds, delicious cooked meals. All gear provided. You carry only a light day pack. TOUR GUIDE: Additional $440 per group per day. This tour is one out of the box. Saltwater Creek is one of those locations along the Light to Light Walk that the locals try not to tell too many people about. It has many hidden treasures and places to explore that are not obvious on the track – so we stay 2 nights in camp to allow you the time to discover its wonders. Sneak up the creeks in a kayak – you’ll feel like you are the only human to ever go there. Check out the amazing cave and beautiful rock pools at the southern end of the beach or wander north and find the beautiful little hidden beach with the great snorkelling spot on the rocky point. Or just kick back in camp and watch the wildlife. You can’t get bored at Salty. 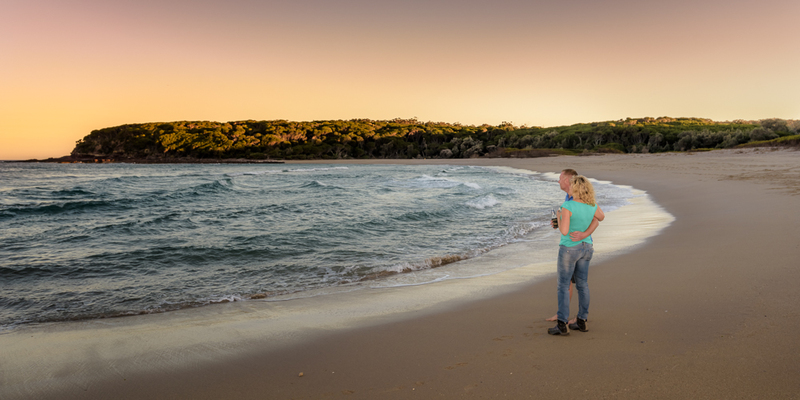 The Light to Light Walk follows some of southeast Australia’s most spectacular coastline. Located in Ben Boyd National Park in Australia’s Coastal Wilderness region, this amazing track passes rock dating back over 360 million years, a marine environment with incomparable diversity, coastal heath and forests of Banksia and Ti-tree. Ancient Aboriginal shell middens on the shores showcase a resource-rich ocean. The stories of an incredible and long-lasting relationship between whalers and Killer Whales adds to the mystery and wonder of this place. This place is very special. Explore it at your own pace without the burden of tents, food and water, and be spoiled at the end of the day with delicious dinners, a hot shower and luxurious camp beds, sleeping bags, sheets and towels. We’ve got you covered. 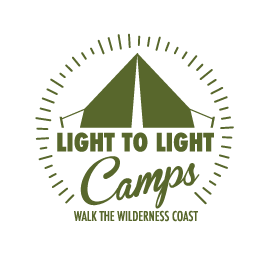 Discover the wonders of the wilderness coast with the support of Light to Light Camps. Use the contact form at the bottom of the page to make an enquiry. Our dates are flexible. You’ll hear back from us within 24 hours. Or, if you prefer, call Jenny Robb at 0429 961 047. 31km through unspoiled coastal wilderness in the Ben Boyd National Park. Wilderness with luxury – we carry your gear, set up your tent, shower and bed. Memory-foam mattresses, percale sheets, luxurious sleeping bags, pillows and towels. During season, watch migrating whales, killer whales and dolphins. Local knowledge – we know the area, its history, and the myriad flora and fauna species you’ll see along the way. The best outdoor recreation gear, including Mont daypacks, OzTent tents, sleeping bags, beds and chairs. Capture and share photos and video of your Light to Light experience – we’ll keep all your toys charged, and find mobile phone coverage for you if you need it. We start this one early. We’ll pick you up from Eden (or meet you at our place at Kiah), go through the daypack contents and drive you to Green Cape for the start of the walk. We will fit you personally with your day pack before you start. A relatively long section, taking you through Bittangabee Bay and on to Saltwater Creek. But there’s no need to rush – just keep a steady pace. You’ll end up on one of the most beautiful surf beaches on the coast. Enjoy a hot shower, settle in for nibbles and a drink before dinner is served by the campfire. Finish with something sweet and tea or coffee, before you snuggle into luxurious sheets and sleeping bag for a well earned rest. This day is all yours. But we’re happy to join you on a journey of discovery, enjoy a picnic on the beach or a swim in surf. Optional guided kayak tours are supported by fully qualified Flatwater Kayak Guides on top quality Hobie kayaks. This place has so much to offer. Choose to do everything or choose to do nothing. It’s up to you. What might you discover? Enjoy a delicious and healthy breakfast while we pack your snacks for the next section, refill your water and check your gear. Then off you go. The walk on this day is quite a bit shorter, but you’ll be blown away again by the amazing scenery. You’re encouraged to stop along the way for refreshments and to take in the stunning and peaceful surrounds – we’ll tell you about all the best spots that only the locals know! Then it’s on to your destination at magnificent Boyd’s Tower. Enquire now – contact us below.